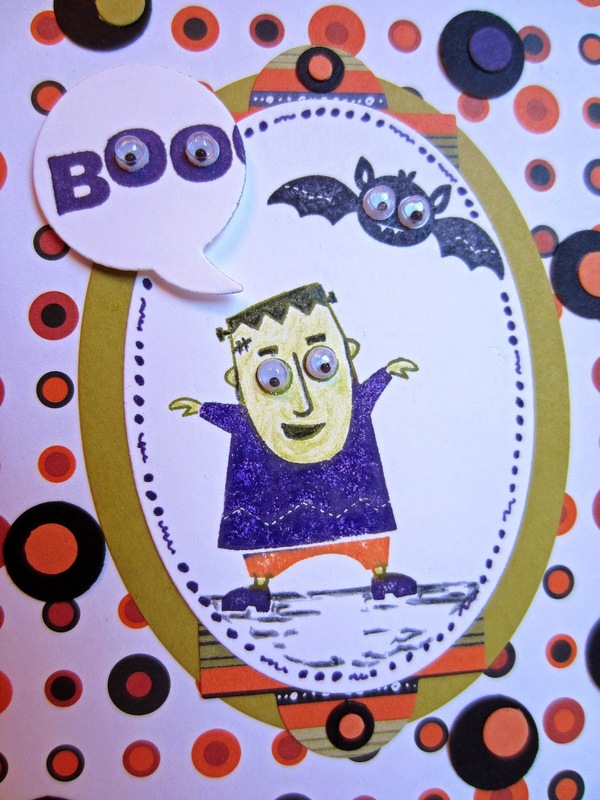 For my little granddaughter Stella's Halloween card this year, I pulled out an oldie-but-goodie stamp set, Googly Ghouls. Almost seven years old, Stella's mommy has been reading the Harry Potter series to her at bedtime. I think they may be in Volume 5, so they've been at it for quite some time. I thought that with her newly-found macabre side, Stella may enjoy a card starring Frankenstein and his buddy, Bat. Of course, since the set was designed this way, and to add to the sense of fun, I added googly eyes to Frank, Bat and the BOO sentiment. I do think that what helps this card to succeed is the use of the various Framelits surrounding Frank 'n' Bat. I used the Ovals Collection, the Apothecary Accents, and the Word Bubbles. To continue with the dotted theme of the Designer Series Paper in the background, I added 1/2" black dots topped by off-center 1/4" dots in the orange, green and purple. A smaller version of the dots adds a bit more flavor to the top and bottom of the label on which the white oval sits. I have to be honest in admitting that before I added the larger dots, I thought the card was fairly "blah". I think the dots added some whimsy and a feeling of being a bit more offbeat. Do you agree that they helped? 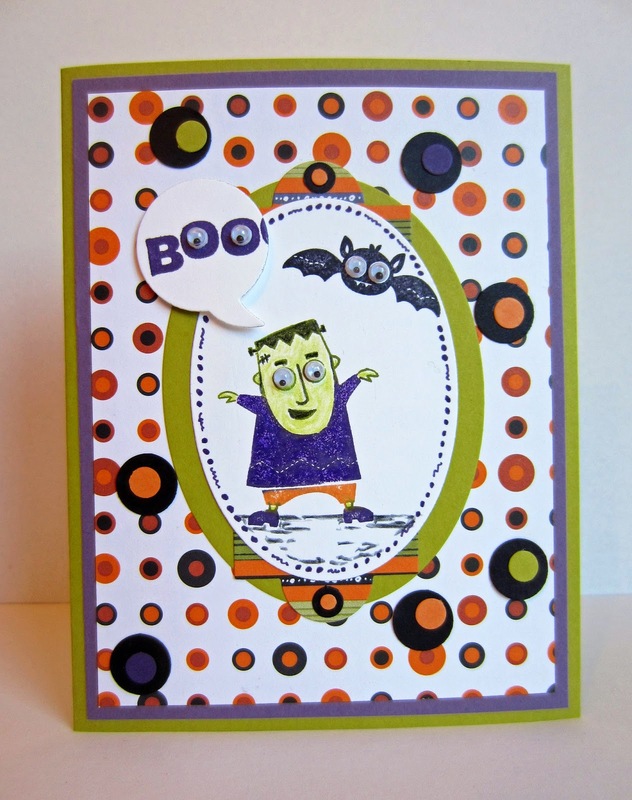 Are you having lots of fun creating Halloween cards? Or maybe you don't do anything special for this spooky day? I usually don't get too caught up in the Halloween thing, but this year, the Halloween greetings just keep flowing out of me. Your granddaughter is going to love the card. Yes, the larger dots added a certain 'bounce' to it. Funny that I myself have been laboring over the mat for folded Christmas trees on cards. Poor hubby, he catches the brunt of my decisions, decisions, decisions. That is a cute card. I even have everything to CASE it. I don't celebrate Halloween much. Not many kids live here so I don't decorate anymore. Well that is the cutest think I have seen today!!! Thanks for stopping by to linkup, Happy Halloween!! !